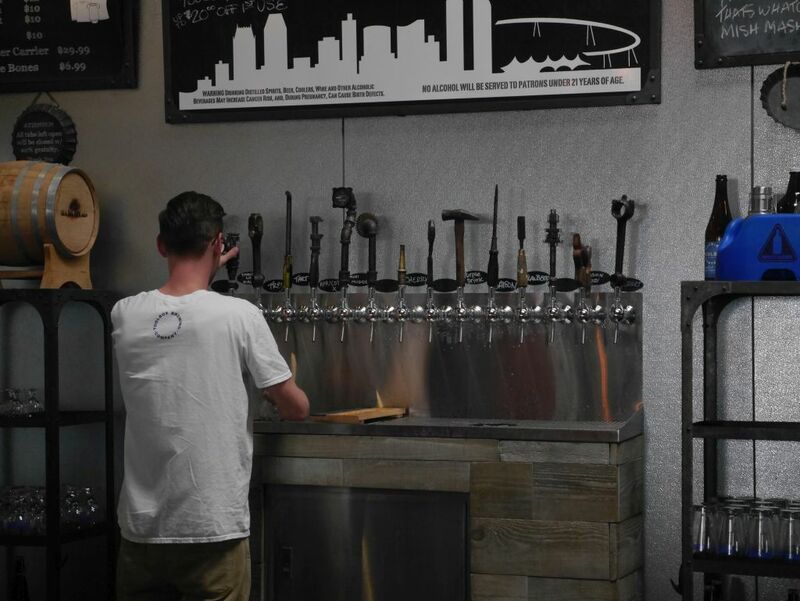 Toolbox Brewing Company – Vista – The Brewery That Showed Me How Delicious Brett Can Be. 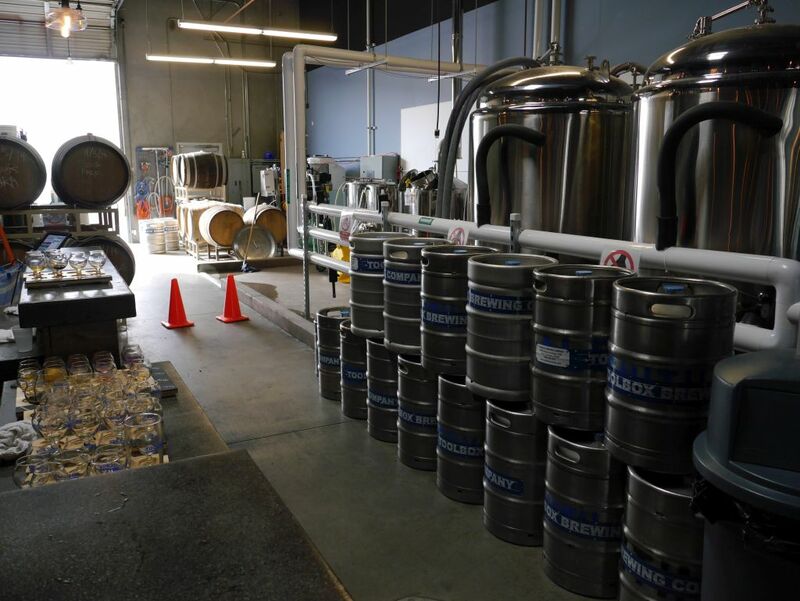 POST UPDATE: This post was written almost a year ago now and there was a big change towards the end of 2015 that resulted in a change of brewers at Toolbox. More updated information is available on my new post Toolbox Revisited. To the uninitiated you might think that having a bunch of brett beers (short for brettanomyces, a wild yeast that brings out some interesting flavors in beers) would mean pointlessly tart and funky brews. I certainly fell into that trap when I first heard that most of their beers were moving over into the brett family. Thankfully, as others have so nicely told me, my ignorance has proved incorrect and the resulting beers are delicious. I don’t fully understand the things that make brett a favorite among certain sectors of the craft beer fans. 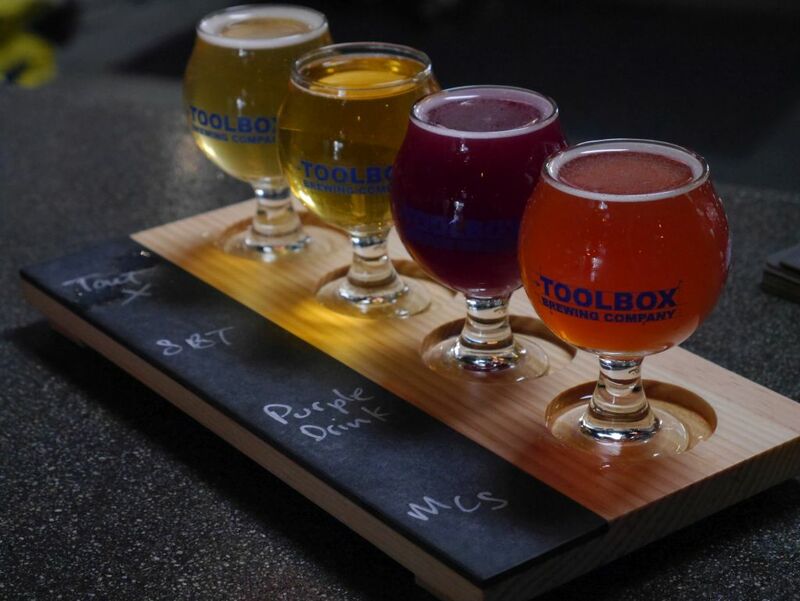 But from what I got to taste today at Toolbox, they are doing a great job getting the right flavors from it for each beer such that it enhances the already delicious flavors. Yes there are some tart beers here and some of them might not be your thing right away but they are still very tasty and complex in just the right way. And they might be what turns you into a tart lover. 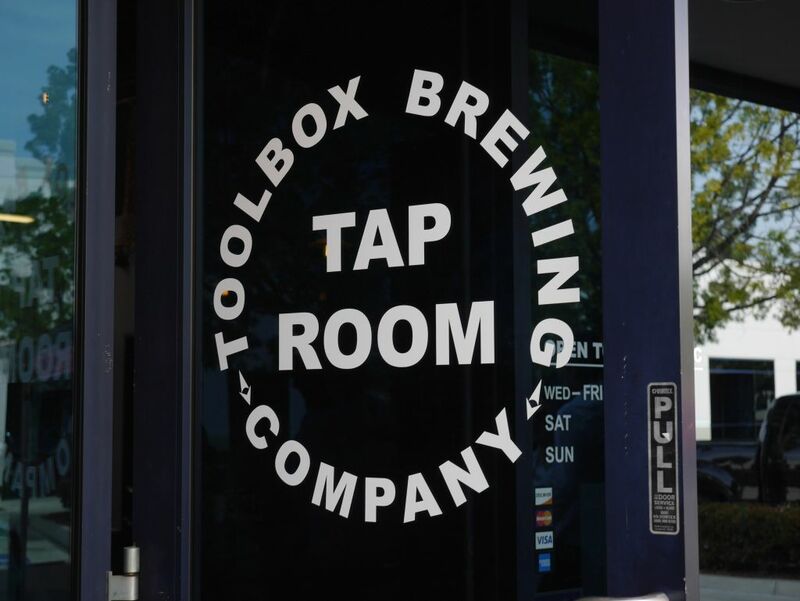 Toolbox isn’t the easiest brewery to find either, hidden away in a tech park that I happened to pull into just as I was beginning to wonder if I had passed it. Luckily for me I turned at the right time and Google informed me that it was in that very parking lot. Like most locations of breweries you wouldn’t guess when you pull in that this is the sort of place to encounter a brewery, but as soon as you see the food truck outside you know you are in the right place. 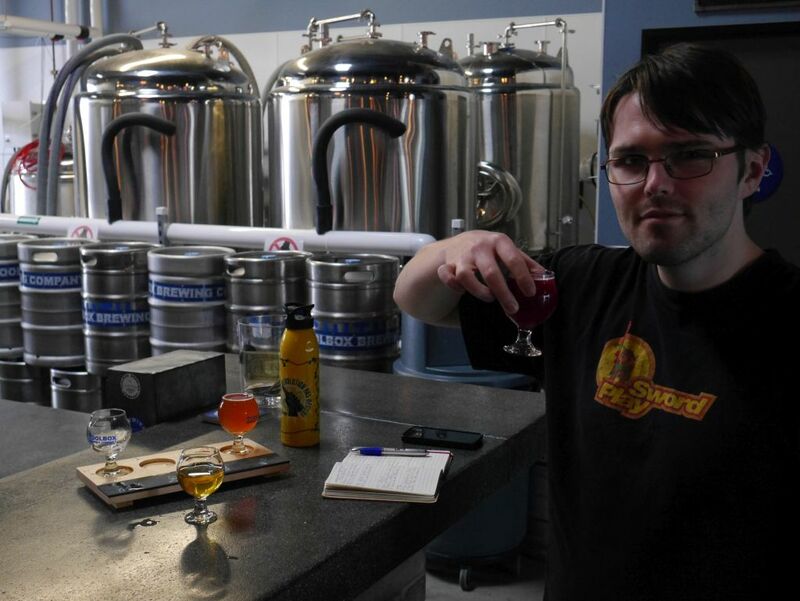 Tart and sour beers are becoming a bit of an obsession to a small portion of the craft beer community in San Diego where complexity and quality of flavor trumps bitter hop bombs. 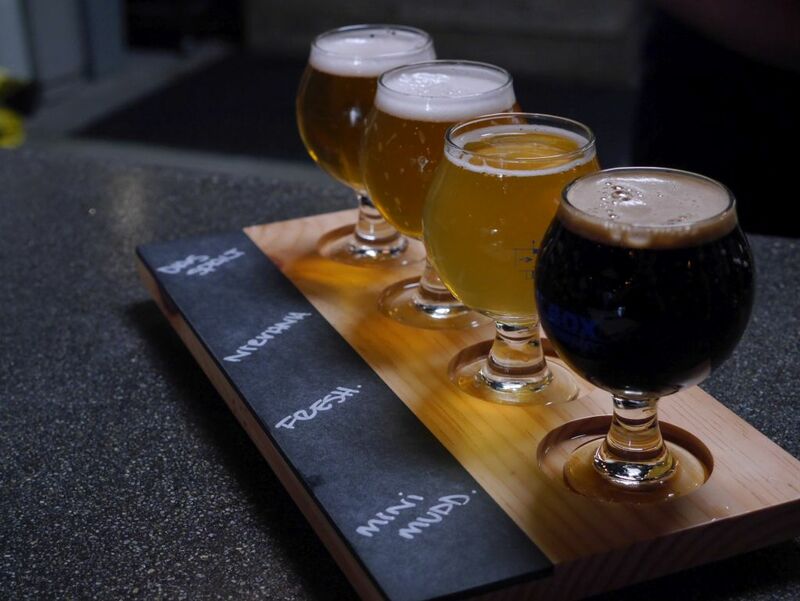 In San Diego these beers are mostly limited to Council Brewing, which has built up a following around its flavored varieties of the tart saison, Lost Abbey, with its sours and farmhouse ales, and more recently Toolbox and Latitude 33. I split my tasting at Toolbox into two sets of 4 tasters. Sadly, they don’t have a discount for having multiple tasters so you can easily spend $18 before tip on 8 tasters. But after you taste the beers you aren’t going to mind because all of them are high quality even if some might not be for you. The first round included the IPA, pale ale, saison, and milk stout. I started with the IPA and immediately I was overwhelmed with an intense grapefruit flavor that I assume was enhanced by the brett yeast. The beer was mildly tart and got close to being too mouth-puckering but it overall resembled a typical west coast style IPA and did so nicely. Next came the pale ale and it also had a mild tartness to it but combined with more of a pineapple flavor. This combined with a nice light sweetness made this a very solid pale ale. This didn’t have any of the typical dark malt colors or flavors you usually see from the style. The saison was quite an impressive version boasting great amounts of spice and pepper with a good balance among everything. The addition of the brett made it a bit more harsh than the Lost Abbey saison but it still was nicely balanced and very tasty. The milk stout was so deliciously roasty that I would have sworn it had coffee added. Turns out it has none so I was all the more impressed. Despite being a milk stout it was not overly sweet as some can be and would satisfy those dark beer fans who accompany friends to toolbox. My next flight included the Tart X, the sweet baby trey (a farmhouse ale with brett) and My Cousin Strawberry and Purple Drink, two fruit flavored beers. Purple drink was a boysenberry beer. Tart X took a while to get used to, being much more tart than anything I had in the first flight. After adjusting a little bit I found the lemon flavors to be quite nice and actually enjoyed it. Next came sweet baby trey, which was my absolute favorite of the day. This famhouse ale mostly came at me with sweetness though nothing overpowering or cloying. It had a nice spice flavor that reminded me of Belgian yeast and overall was the most delicious of the bunch. Me enjoying the second flight. Next came my cousin strawberry, a beer that had just the right combination of strawberry and kiwi with a very mild tart flavor. The color of the beer was very interesting as well, almost a light pink. The purple drink was a nice dark purple color and was mildly tart as well. This one was based on the saison and had plenty of good berry flavor. Fruit beers being what they are most of these are smaller batch and so the flavors available might be different when you visit the brewery. 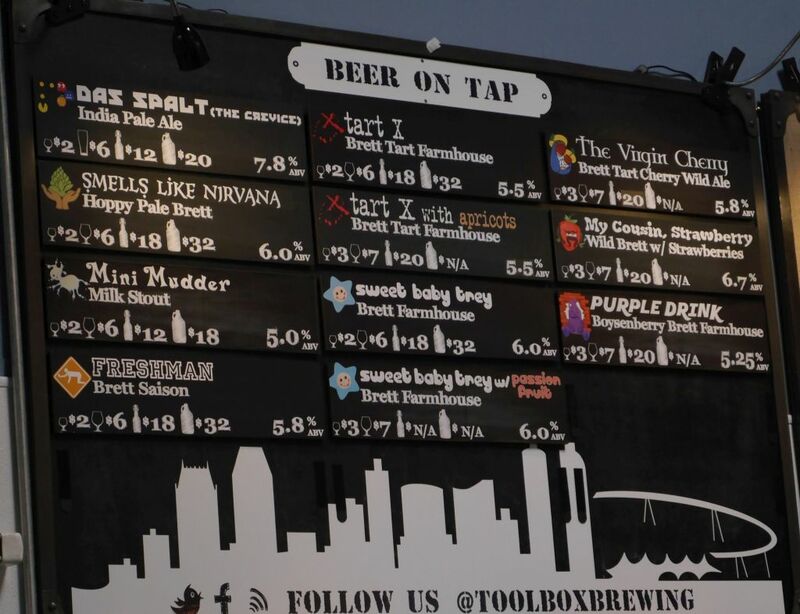 Some may have seen me call Toolbox bold for moving their beers to mostly brett. I can safely say that the beers were all very well-made and balanced. I was also glad to hear that there is another even more traditional west coast style IPA in the pipeline as well, which should satisfy some who don’t like what I got to try. 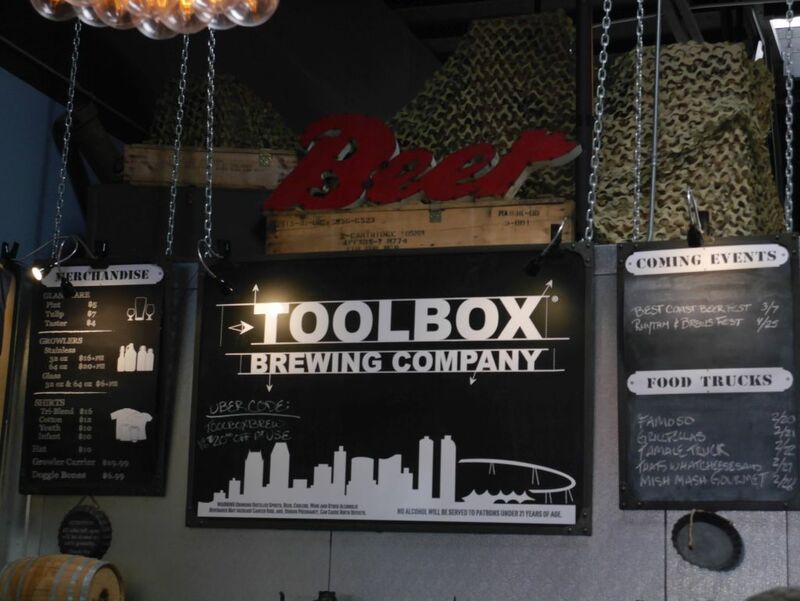 Having now tried the beers available at Toolbox I can say that they made the right decision and the complexity of flavors helps them stand out.